On Wednesday, the Free Thought Project reported on the remarkably brave stance Academy Award-winning film director Quentin Tarantino, has made in owning his comments condemning police brutality. Tarantino was not calling all cops murderers, nor was he purporting that he “hates cops.” However, these facts are not important to those throwing bricks from the other side of the blue wall. But the truth is irrelevant to some. In an interview with the Hollywood Reporter, the executive director for the largest police union in the country, representing 330,000 full-time cops, said police have a ‘surprise’ for Tarantino. This ‘surprise’ is in response to Tarantino ‘calling cops murderers’ and the police seem entirely unconcerned with the notion that this never happened. The FOP, based in Washington, D.C., consists of more than 330,000 full-time, sworn officers. According to Pasco, the surprise in question is already “in the works,” and will be in addition to the standing boycott of Tarantino’s films, including his upcoming movie The Hateful Eight. Calling it a ‘surprise’ in no way lessens the fact that those who are sworn to uphold the constitution, including protecting free speech, are threatening a man for practicing his free speech. 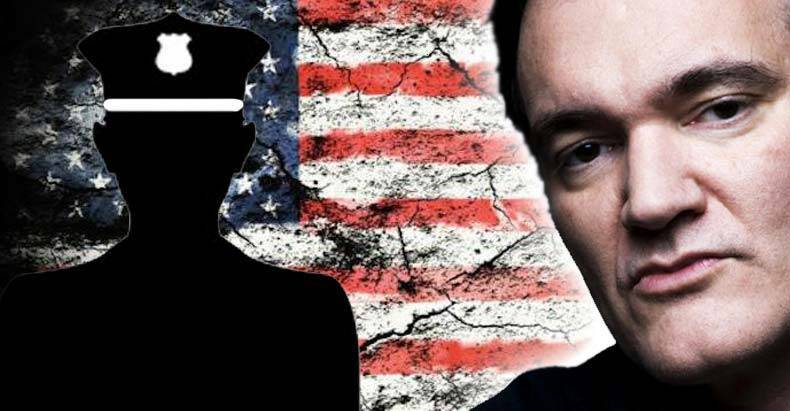 All Quentin Tarantino did was call a murderous cop a murderer, and for this the largest group of cops in the United States is now threatening him. “The right time and place will come up and we’ll try to hurt him in the only way that seems to matter to him, and that’s economically,” says Pasco. When THR asked Pasco if this was indeed a threat, Pasco said no, at least not a physical threat. Since when is it okay for police officers to threaten to hurt people, either physically or ‘economically’ for saying something they didn’t agree with? These public servants are not only waging a war against free speech, but they are threatening to cause economic harm to an individual. It is sheer tyrannical insanity! Please share this story with your friends and family to show them the lengths that their taxpayer-funded public servants will go to stifle the free speech of one individual.